We are flashing back to the 1930’s today, with a postcard of the Yellow Gables Inn. 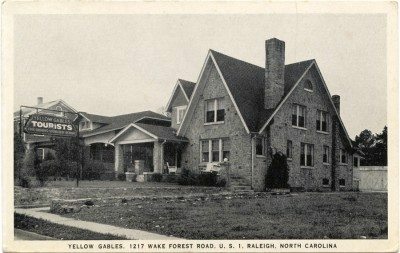 Built around 1925 by William and Ella Johnson, it was a Tudor Revival motel that capitalized on the increasing tourist traffic on Old Wake Forest Road. Until Interstate 95 and Capital Boulevard were built in the 1950s, this road through the historic Mordecai neighborhood was U.S. Highway 1, the main highway connecting New York to Florida. Raleigh was the halfway point when the automobile era began in the 1920s. Owners of the homes lining the route sought to cash in by renting rooms. The main building has a residential appearance, which blends into the residential neighborhood that surrounds it. Located at 1217 Wake Forest Road, it is now known as the Gables Motel Lodge, and is the last of these “tourist homes” still operating. Happy Thursday!